How to understand your clients' true illnesses, not just their DSM checklists. Though the DSM discusses the criteria for mood disorders in absolute terms—either present or absent—professionals are aware that while such dichotomies are useful for teaching, they are not always true in practice. Recent genetic data support clinicians' longstanding recognition that a continuum of mood disorders between unipolar and bipolar better matches reality than a yes/no, bipolar-or-not approach. If we acknowledge that continuum, how does this affect our approach to diagnosis and treatment? 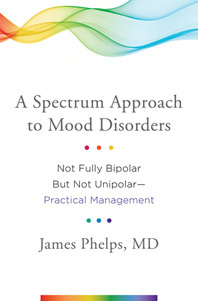 In A Spectrum Approach to Mood Disorders, nationally recognized expert James Phelps provides an in-depth exploration of the signs, symptoms, and nuanced presentations of the mood disorder spectrum, focusing on the broad gray area between Major Depression and Bipolar I. 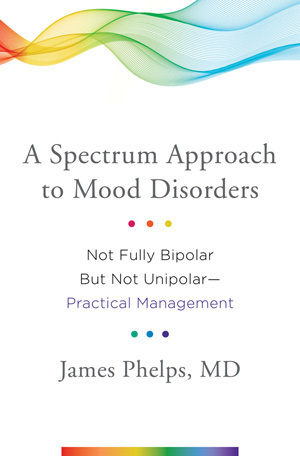 Combining theoretical understanding and real-world scenarios, Phelps offers practical treatment guidelines for clinicians to better understand the subtle ways mood disorders can show up, and how to find the most beneficial path for treatment based on the patient's individual pattern of symptoms. Is it trauma, or is it bipolar? Borderline? Both? Phelps's expertise and wealth of personal experience provides readers with unparalleled insight into a subject that is by nature challenging to define. His emphasis on non-medication approaches, as well as chapters on all the major pill-based treatments (from fish oil to lithium to the avoidance of atypical antipsychotics and antidepressants), creates a comprehensive resource for any clinician working with patients on the mood spectrum. Appendices on the relationship between bipolar diagnosis, politics, and religion; and a plain-English approach to the statistical perils of bipolar screening, offer further value. Phelps has written an invaluable guide of the critical information professionals need to treat patients on the mood disorder spectrum, as well as a useful tool for highly motivated families and patients to better understand the mood disorder that effects their lives. This book seeks to alter the black and white language surrounding these mood disorders to influence a shift in how patients are diagnosed—to insure that treatment matches their specific needs.